Yvan Mendy has vowed to use England as the perfect platform to knock out Luke Campbell and earn an overdue world-title shot. 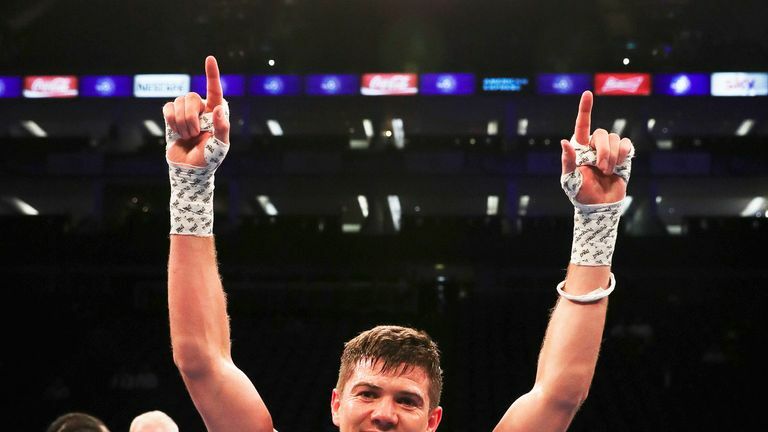 The Frenchman is back to take on 'Cool Hand' at Wembley Stadium, live on Sky Sports Box Office, on Saturday night, in an eliminator for the WBC lightweight title. Mendy out-pointed Cambell at The O2 in December 2015, and although he has won all seven fights since, he has not been able to challenge current WBC holder Mikey Garcia or any of the other recognised champions. Campbell pushed Jorge Linares to the limit with the WBA on the line and Mendy admits he now needs to use England to get himself a long-overdue tilt at the world title. "I do feel a bit frustrated that I haven't had a world title opportunity yet," he said. "He (Campbell) lost to me and yet he was able to fight Linares for the world title! So that does leave me a bit frustrated. "You do suffer being a boxer in France, it's a cultural thing. In England boxing is a part of the culture, over here it just isn't. I've often said to myself if I were English I'd already be world champion! Or at least I would have had the chance to fight for it. "At the moment I feel like I'm unbeaten because I haven't lost for so long. Mentally I have forgotten about my defeats and in my mind when I go in the ring I feel undefeated. I feel as strong as ever." Campbell has revealed he has not looked back at his first fight with Mendy, that saw him put down in the fifth round and pick up his first professional loss via a split decision. The Paris-born 33-year-old has barely watched his opponent since then but wants to really fire out a warning to the rest of the lightweight division. "I don't necessarily see it as a big advantage, the fact that I won the first fight, simply because it has been three years since that and we change, all of us," he said. "After three years we forget about a loss. I don't think mentally it will play on his mind because a lot of things happen in that time. "For me, it's important to win by knockout to make a statement. I'm not here for the sake of it, I'm ready to win this, I want a nice victory." Watch Campbell vs Mendy on the Joshua vs Povetkin undercard, at Wembley Stadium, on September 22, live on Sky Sports Box Office, from 6pm. Book via your Sky remote or book it online here.